You hear that mortgage interest rates are at an all-time low, hovering near historic levels of inflation. That's practically free money in the long-term. You, however, committed to a fixed-rate mortgage several years ago, so you're paying 6 percent while the neighbor's kid is paying 3.25 percent. Should you refinance? First, a background for those of you unfamiliar with the vocabulary: "refinancing" a mortgage means that you get a new mortgage. You "repeat-finance" -- you finance it again, with an altered payment plan. Many people with fixed-rate mortgages who refinance are motivated by the opportunity to snag a lower interest rate. Small differences in interest rate make a big difference. Compare two 30-year mortgages of $240,000. One carries a 4.00 percent interest rate, and the other carries a 4.25 percent interest rate. That doesn't sound like a big difference, does it? It's just one-quarter of a percent, right? How much of a difference could that make? Small amounts compound into huge sums. At the end of 30 years, the holder of the 4.25 percent rate will have paid roughly an extra $10,000 over the life of the loan, as compared to the holder of a 4.00 percent mortgage. Clearly, the biggest benefit to refinancing is the opportunity to lower your interest rate, shaving thousands off your total loan payment. But every rose has its thorn: refinancing will re-start your mortgage clock, bringing your amortization schedule back to square one. "Huh? What does that mean?" Here's how mortgages work: When you make a payment, some percentage of that payment goes towards your interest. The remaining amount goes toward your original loan principal. The more that your payment applies to your principal, the better. Paying down your principal balance allows you to pay off the loan faster. (That's why you should make sure that any extra mortgage payments apply toward your principal). When you start a new mortgage, the majority of your payment applies toward the interest. Only a tiny sliver of it goes towards your principal. At the end of your first year of mortgage payments, you'll see that you've barely made a dent in your principal balance. The further along you progress within your mortgage, the more your payments will apply to your principal. By your 25th year of a 30-year mortgage, nearly all of your payments will be applied toward your principal. "This is fascinating, really. (Yawn.) But how does it apply to refinancing?" When you refinance a mortgage, you reset the clock back to year one. The majority of your payments will apply toward interest, not principal. If you're still in the first few years of your mortgage, this isn't a big deal. But if you're further along in your mortgage, you should run a spreadsheet to see if the lower interest rate justifies the clock rewind. Let's say Joe has a $100,000 mortgage at 6 percent interest. His monthly payment is $599. At the end of Year 1, Joe has paid $7,188 towards his mortgage. Only $1,299 of that paid down the principal balance. The rest was gobbled by interest. Only one year into his 30-year mortgage, Joe discovers he can get a new loan at 5 percent. Joe refinances, closing out his old mortgage and re-starting the clock. He pays $1,000 in closing costs for his new loan. At 6 percent, Joe would have paid $109,871 in interest payment over the life of the loan (paying a total of $209,871 for his $100,000 house). By refinancing, Joe "loses" the $5,889 in interest that he paid for the first year of his loan. Ouch. But it's worthwhile. By switching to a 5 percent mortgage, Joe now will only pay $95,483 in interest over the life of the loan, rather than $109,871. In other words, his move saves him $14,387. But let's assume Joe was in year 15 of his 30-year mortgage when he discovered the opportunity to refinance. He doesn't want a new 30-year commitment, so he refinances into a 15-year mortgage. What happens? Despite dropping the interest rate down to 5 percent, and accelerating payments through a 15-year mortgage, Joe pays MORE interest by refinancing than he did under the original scenario. In other words, refinancing is a terrible deal for Joe, because he's too far into his mortgage. Don't assume that refinancing is always a good or a bad idea. 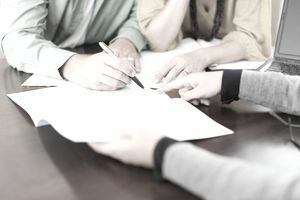 Plug your interest rate, loan terms and closing costs into a spreadsheet or an online refinance calculator, to calculate if the potential deal that you're being offered makes sense in your particular circumstance. As a general rule of thumb, if you're within the first few years making mortgage payments and you can knock the interest rate down by 0.75 percent or more, you should consider it. The earlier within your mortgage you refinance, the better.